On December 11, 2017, TFP Student Action volunteers traveled to Sao Paulo, Brazil to attend a symposium commemorating the Centennial of Our Lady of Fatima sponsored by the Instituto Plinio Corrêa de Oliveira. Although from different parts of the world, a common ideal united everyone: Fight for the Catholic Church, fight for the rights of God and Our Lady, and defend the values and culture of Christian Civilization. Those who gathered were inspired by the ideas and exemplary life of the late Prof. Plinio Corrêa de Oliveira, founder of the Brazilian Society for the Defense of Tradition, Family and Property, the first TFP. 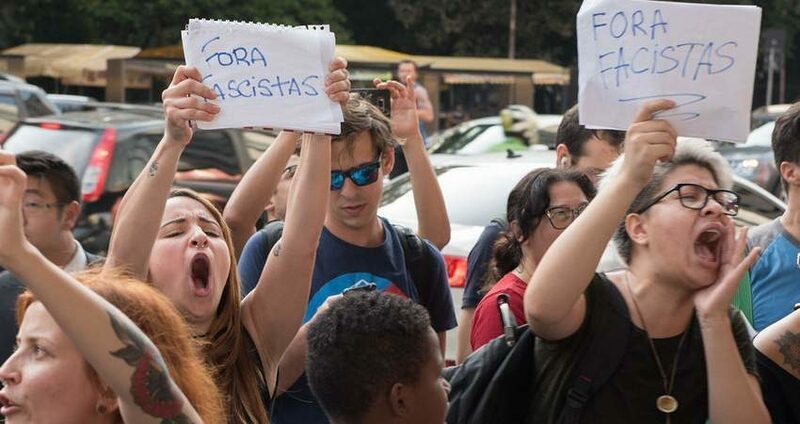 While in Brazil, an enormous campaign was held to alert public opinion about the forced imposition of gender ideology in the public school system, which is being enforced in Brazil, against the will of most parents. Members from dozens of TFPs and like-minded organizations gathered for the event, including delegations from Canada, the Netherlands, France, Poland, Germany, Italy, Chile, Argentina, the Philippines, Ireland, the United States, and, of course, Brazil, the host country. On Friday, December 16, hundreds of pro-family volunteers converged on the Paulista Avenue, one of Sao Paulo’s biggest avenues -- a major hub for businesses, shopping, street vendors, bicyclers, tourists, and businessmen. The 200-300 members of the TFP or sister groups formed into six sub groups along the avenue as they held standards, banners, signs, played music, or handed out pro-family fliers, which unmasked the lies of gender ideology. Passersby were attracted by the two marching bands, going up and down the street. People came out of their work buildings wondering what was going on and more often than not, accepted a flier. For example, Mr. Ted Huereña, a member of the American TFP, was violently pushed from behind into oncoming traffic. Another member was punched by a gender ideology advocate. One leftist wrenched the slide out of Mr. Gregory Escaro’s trombone and threw it into the street, causing considerable damage to the musical instrument. Other TFP members were doused with buckets of water and remained calm and peaceful. Nearing the end of the campaign, when everyone gathered for a final prayer on the sidewalk, a cluster of frantic pro-homosexual counter-protesters formed. They yelled incoherent and vulgar provocations and insults, but TFP Student Action members continued playing music and praying.